Winky & Wonder Anniversary Celebration Book Special! In appreciation of our readers we are offering our very first sale, available only through Whisperland Castle. Reduced price: $6.99 (plus shipping) while supplies last! * Offer available within the US only. Please visit Amazon.com for international purchases. Sorry, no returns or refunds with this special offer. 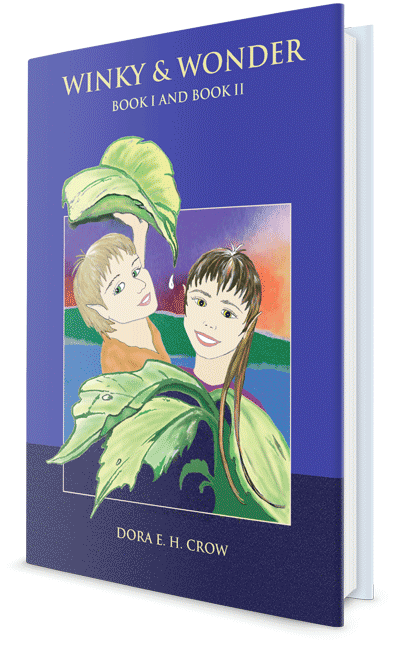 "Winky & Wonder", an intriguing fantasy book, teaches children the importance of understanding how their words and actions (whether kind or hurtful ones) create ripples that spread and affect other people in the world. Invisible to humans' eyes and unheard by their ears, Winky and Wonder whisper directly to children's hearts, encouraging them to listen to what they already know deep inside. Although Winky & Wonder is a children's book its messages are timeless and intended for all ages. This is a "chapter book", which means the story is told primarily through prose, rather than images. 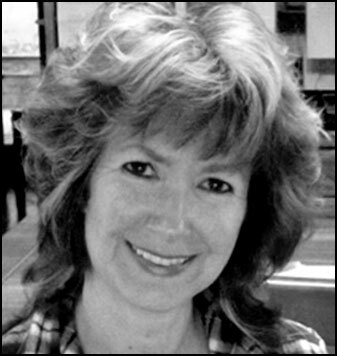 The story contains six black and white drawings illustrated by the author. Paperback: 96 pages, Product Dimensions: 9.8 x 6.8 x 0.3 inches. 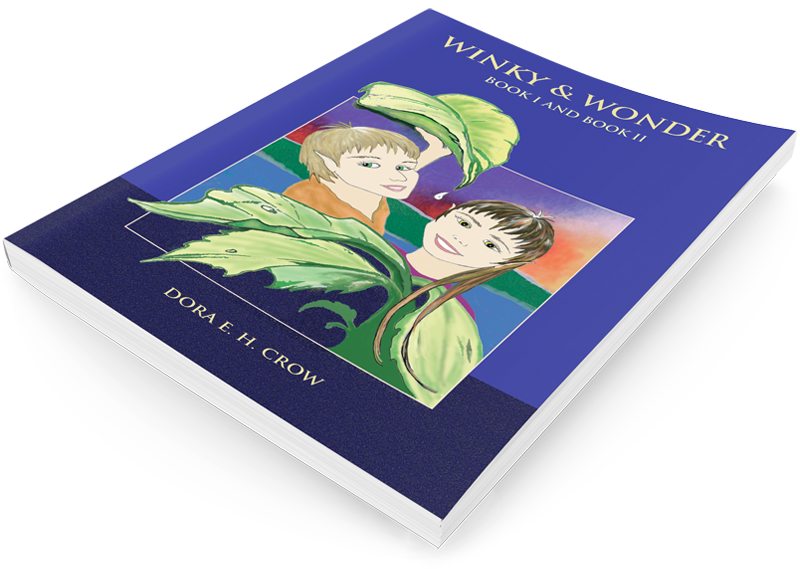 Character education is especially important in today's world; the children's book, "Winky & Wonder" by Dora E. H. Crow, presents an enjoyable way for parents and educators to introduce this theme... Families and educators can use the stories in 'Winky & Wonder' to initiate discussions with children about situations in their own lives and help them to begin exploring 'listening to their hearts'." Receive occasional emails directly from Whisperland Castle! * Offer available within the US only. Please visit Amazon.com for international purchases. Dora E. H. Crow spent most of her childhood growing up in a beautiful area of Newfoundland, N.J. While playing in the forest with her many pets she always imagined she would write a book one day. And so she did! Mrs. Crow created Winky and Wonder to help guide her own children to make thoughtful decisions by listening to their hearts. While writing the book she saw the story begin to take on a life of its own as it began actually teaching her many important life lessons. © Copyright 2019 Dora E. H. Crow. All Rights Reserved. Our ecommerce is handled through Paypal. They provide us with the online e-commerce service that allows us to sell our products to you. This website is operated by Dora E. H. Crow. Throughout the site, the terms “we”, “us” and “our” refer to Dora E. H. Crow. Dora E. H. Crow offers this website, including all information, tools and services available from this site to you, the user, conditioned upon your acceptance of all terms, conditions, policies and notices stated here. You understand that your content (not including credit card information), may be transferred unencrypted and involve (a) transmissions over various networks; and (b) changes to conform and adapt to technical requirements of connecting networks or devices. Credit card information is handled by PayPal. SECTION 8 - THIRD-PARTY LINKS Certain content, products and services available via our Service may include materials from third-parties. In no case shall Dora E. H. Crow, our directors, officers, employees, affiliates, agents, contractors, interns, suppliers, service providers or licensors be liable for any injury, loss, claim, or any direct, indirect, incidental, punitive, special, or consequential damages of any kind, including, without limitation lost profits, lost revenue, lost savings, loss of data, replacement costs, or any similar damages, whether based in contract, tort (including negligence), strict liability or otherwise, arising from your use of any of the service or any products procured using the service, or for any other claim related in any way to your use of the service or any product, including, but not limited to, any errors or omissions in any content, or any loss or damage of any kind incurred as a result of the use of the service or any content (or product) posted, transmitted, or otherwise made available via the service, even if advised of their possibility. Because some states or jurisdictions do not allow the exclusion or the limitation of liability for consequential or incidental damages, in such states or jurisdictions, our liability shall be limited to the maximum extent permitted by law. You agree to indemnify, defend and hold harmless Dora E. H. Crow and our parent, subsidiaries, affiliates, partners, officers, directors, agents, contractors, licensors, service providers, subcontractors, suppliers, interns and employees, harmless from any claim or demand, including reasonable attorneys’ fees, made by any third-party due to or arising out of your breach of these Terms of Service or the documents they incorporate by reference, or your violation of any law or the rights of a third-party. These Terms of Service and any separate agreements whereby we provide you Services shall be governed by and construed in accordance with the laws of Santa Cruz, CA, 95065, United States. Questions about the Terms of Service should be sent to us via our website contact form.